Aiseesoft Data Recovery güçlü ve güvenli bir veri kurtarma programıdır. 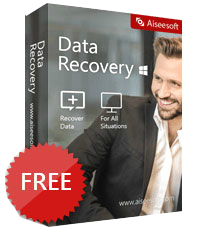 Aiseesoft Data Recovery güçlü ve güvenli bir veri kurtarma programıdır. Uygulama tüm silinmiş/ kayıp fotoğrag, doküman, eposta, ses dosyası, video ve daha fazlasını sabit diskte, RAW sürücüde, flash sürücüde, kamera ve dijital kameralardaki hafıza kartı/çubuğunda kurtarabilmektedir. Aiseesoft %50 indirim kodu: AISESUOD (tüm önerilen ürünlerde ve diğerlerinde geçerli) tüm GOTD kullanıcılarına özel verilmektedir. Aiseesoft FoneLab is the most reliable iPhone/iPad/iPod data recovery software. It allows you to retrieve the deleted text files (contacts, text messages, call logs, notes, etc. ), and lost media content (photos, music, videos, etc.) from iOS devices directly. Also it lets you restore iOS data from iCloud or iTunes backup. Completely compatible with iOS 10.3, it does a great job in backing up latest iPhone 7, iPhone SE, iPhone 6s/6s Plus, iPad Pro and iPad mini 4 on your PC. In its latest upgrade, this software adds new feature, iOS System Recovery, which enables to fix your iPhone disabled, recovery mode, DFU mode, etc. to normal for using conveniently. In its latest upgrade, this software adds new feature, iOS System Recovery, which enables to fix your iPhone disabled, recovery mode, DFU mode, etc. to normal for using conveniently. Now get it with 50% OFF Coupon: AISESUOD for all GOTD users. Aiseesoft FoneLab for Android – Android Data Recovery Aiseesoft FoneLab for Android is one of the best Android data recovery tool. It allows you to recover deleted data (text messages, contacts, call logs, photos, music, videos, audio, WhatsApp data, and documents) from Samsung, HTC, LG, Huawei, Sony, Sharp, Windows phone, and Android tablet or SD card. In the latest upgrade, FoneLab for Android supports fixing your frozen, soft brick, password-forgot, not-responsive, black screen Now get it with 50% OFF Coupon: AISESUOD for all GOTD users. Aiseesoft Mac Cleaner is a professional Mac management tool to remove junk files, clutter, large/old files, shred files, delete duplicate/similar images/files and manage all extensions installed on your Mac. You can use it to help you uninstall apps and logs in one click. What’s more, you are capable of taking it to check the disk utilization, battery status, memory usage and CPU usage, so that you can monitor your computer to speed up it greatly. Now get it with 50% OFF Coupon: AISESUOD for all GOTD users. Aiseesoft Video Converter Ultimate is the most professional multifunctional video utility. It converts video to other format (MP4, MOV, AVI, MKV, FLV, etc.). It also supports converting video resolution among 4K, HD and SD to meet your needs. This program gives away to you for downloading hot videos from video-shared websites (YouTube, Yahoo, Facebook, etc.). Its powerful editing functions enable you to edit special video effects and rotate sideways video. It also enhances your video quality by upscaling video resolution, optimizing brightness automatically, remove videos noise and reduce video shaking. You can add/delete/change the subtitle or audio track for your video file to get what an ideal that you want. Now get it with 50% OFF Coupon: AISESUOD for all GOTD users. Aiseesoft Screen Recorder is an easy-to-use screen recorder. It allows you to record online video and audio with high quality. You can capture streaming videos and VOD videos to save them in your PC for playback. This screen recording software enables you to make your own video tutorials and record webcam videos with few clicks. The simple interface directs you to save living videos and capture free songs from radio, etc. easily. Note: In its latest update, it lets you edit video while recording and add effects for your captured snapshot. Now get it with 50% OFF Coupon: AISESUOD for all GOTD users.